While Ubisoft's still-secret, yet-to-be named Rainbow Six game skipped an E3 appearance this year, it is still very much in the works we're told. Here is our first look at early, rough images leaked to us from the game, a game that promises to mix the former glory of the hard-as-nails tactical shooter with a brand new gameplay twist: Morality. Rainbow Six will be a far more story-driven game that previous iterations of the Tom Clancy branded title with gamers tasked with stopping a homegrown terrorist group operating in America. The group, fed up with the greed of Wall Street and the government that acts to protect them, decided to target New York City. At the heart of the game is a branching morality system that changes the outcome of key moments in the game based on the in-the-moment decisions the player makes. Early development currently has the outcome of these decisions shape the path you take toward the game's ending, with many of the levels having multiple endings. These decisions, we're told, can drastically change the story. In practice, that means that it will be impossible to play every level in the game on a single play-through. Instead, gamers will be rewarded with new experiences based on the changing decisions they make in subsequent plays of the game. In action the decisions a player is forced to make seem like they can be emotional, powerful moments in the game. In one example seen first hand by Kotaku, for instance, the terrorists break into a home and kidnap a stranger. You take on the roll of that stranger, forced to hold a trigger button to prevent a vest loaded with explosives from blowing up. 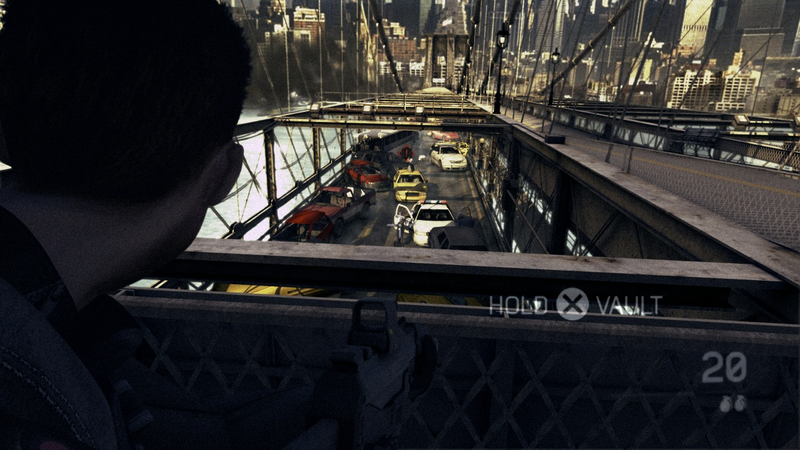 Later, on a heavily-populated bridge in New York City, the perspective shifts, having you control the Rainbow 6 team there to take down the terrorists and take out the hapless, walking bomb. The in-game graphics highlight where other members of the team are as you work your way to the innocent wearing the suicide vest. Icons allow you to target particular body parts on enemies, allowing you to decide whether to kill or incapacitate. Those icons show you the blast radius surrounding the man holding the detonator, once you approach him. They also show you how many people are in the vehicles nearby, like a bus that is packed with nearly 100 people. The decision you're forced to make in this scenario is to sacrifice the man with the explosives, or risk the lives of hundreds. One option has you tossing the man from the bridge, experiencing some of his memories as he plummets, and then watching him explode. As heart-rending as that moment was, it sounds as if Ubisoft is still weighing the cost and benefits of implementing this new, interesting morality system in the game. One option has the game not including it at all. If it remains, the notion of shaping a game by morally-driven decisions is a powerful new element rarely seen in a shooter. This new idea has the power to not just move Rainbow 6 beyond the realm of today's shooters, but perhaps many of today's games. I love my shooters. But the video I saw of this game and the way it seems to be adding to the mix the very real human cost of gunplay, of decisions that impact not just a country's safety, but a person's, is vastly intriguing to me.